Imagine you are standing beside some tram tracks. In the distance, you spot a runaway trolley hurtling down the tracks towards five workers who cannot hear it coming. Even if they do spot it, they won’t be able to move out of the way in time. As this disaster looms, you glance down and see a lever connected to the tracks. You realise that if you pull the lever, the tram will be diverted down a second set of tracks away from the five unsuspecting workers. However, down this side track is one lone worker, just as oblivious as his colleagues. So, would you pull the lever, leading to one death but saving five? This is the crux of the classic thought experiment known as the trolley dilemma, developed by philosopher Philippa Foot in 1967 and adapted by Judith Jarvis Thomson in 1985. 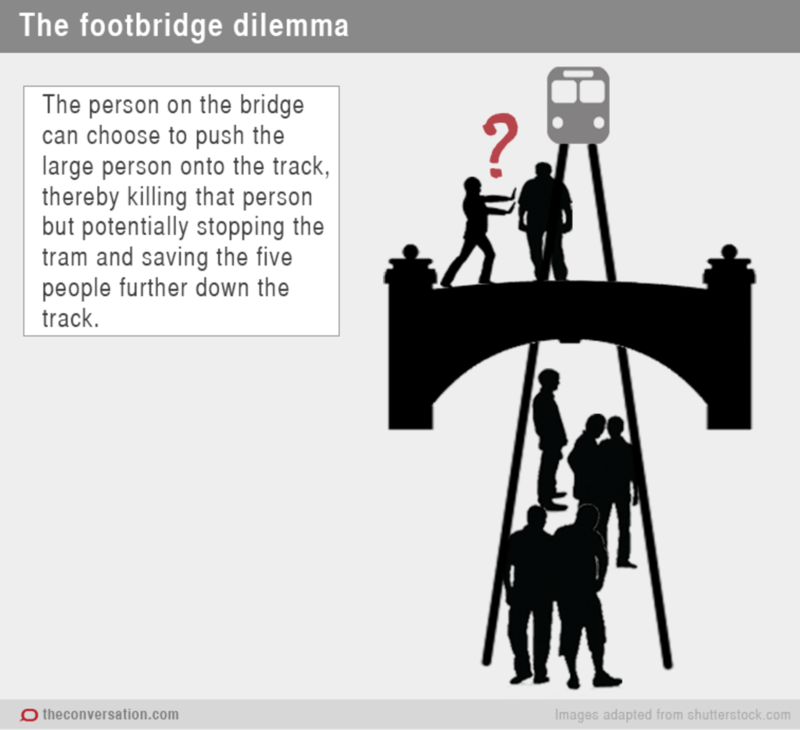 The trolley dilemma allows us to think through the consequences of an action and consider whether its moral value is determined solely by its outcome. The trolley dilemma has since proven itself to be a remarkably flexible tool for probing our moral intuitions, and has been adapted to apply to various other scenarios, such as war, torture, drones, abortion and euthanasia. Now consider now the second variation of this dilemma. Imagine you are standing on a footbridge above the tram tracks. You can see the runaway trolley hurtling towards the five unsuspecting workers, but there’s no lever to divert it. However, there is large man standing next to you on the footbridge. You’re confident that his bulk would stop the tram in its tracks. So, would you push the man on to the tracks, sacrificing him in order to stop the tram and thereby saving five others? 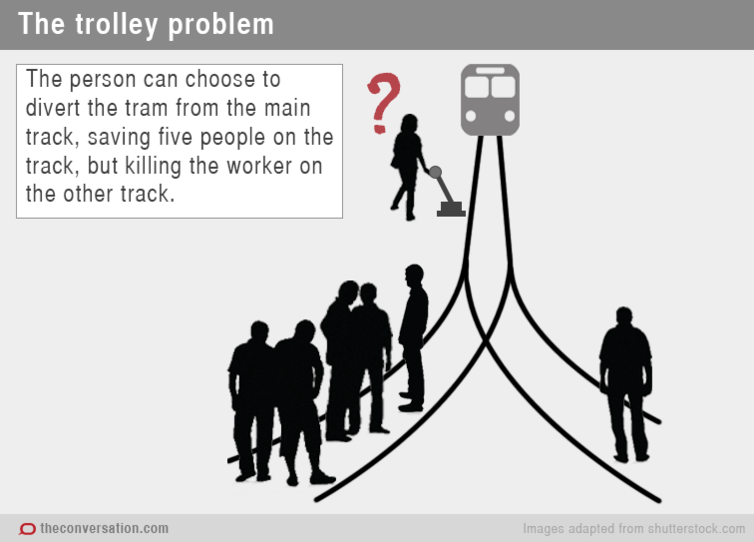 The outcome of this scenario is identical to the one with the lever diverting the trolley onto another track: one person dies; five people live. The interesting thing is that, while most people would throw the lever, very few would approve of pushing the fat man off the footbridge. Thompson and other philosophers have given us other variations on the trolley dilemma that are also scarily entertaining. Some don’t even include trolleys. Imagine you are a doctor and you have five patients who all need transplants in order to live. Two each require one lung, another two each require a kidney and the fifth needs a heart. In the next ward is another individual recovering from a broken leg. But other than their knitting bones, they’re perfectly healthy. So, would you kill the healthy patient and harvest their organs to save five others? Again, the consequences are the same as the first dilemma, but most people would utterly reject the notion of killing the healthy patient. Inconsistent or are there other factors than consequences at play? If all the dilemmas above have the same consequence, yet most people would only be willing to throw the lever, but not push the fat man or kill the healthy patient, does that mean our moral intuitions are not always reliable, logical or consistent? Perhaps there’s another factor beyond the consequences that influences our moral intuitions? Foot argued that there’s a distinction between killing and letting die. The former is active while the latter is passive. In the first trolley dilemma, the person who pulls the lever is saving the life of the five workers and letting the one person die. After all, pulling the lever does not inflict direct harm on the person on the side track. But in the footbridge scenario, pushing the fat man over the side is in intentional act of killing. This is sometimes described as the principle of double effect, which states that it’s permissible to indirectly cause harm (as a side or “double” effect) if the action promotes an even greater good. However, it’s not permissible to directly cause harm, even in the pursuit of a greater good. Thompson offered a different perspective. She argued that moral theories that judge the permissibility of an action based on its consequences alone, such as consequentialism or utilitarianism, cannot explain why some actions that cause killings are permissible while others are not. If we consider that everyone has equal rights, then we would be doing something wrong in sacrificing one even if our intention was to save five. Research done by neuroscientists has investigated which parts of the brain were activated when people considered the first two variations of the trolley dilemma. They noted that the first version activates our logical, rational mind and thus if we decided to pull the lever it was because we intended to save a larger number of lives. However, when we consider pushing the bystander, our emotional reasoning becomes involved and we therefore feel differently about killing one in order to save five. Are our emotions in this instance leading us to the correct action? Should we avoid sacrificing one, even if it is to save five? The trolley dilemma and its variations demonstrate that most people approve of some actions that cause harm, yet other actions with the same outcome are not considered permissible. Not everyone answers the dilemmas in the same way, and even when people agree, they may vary in their justification of the action they defend. These thought experiments have been used to stimulate discussion about the difference between killing versus letting die, and have even appeared, in one form or another, in popular culture, such as the film Eye In The Sky.